TBILISI, DFWatch–An exhibition of handicraft art made by prisoners at the women’s facility is open for visitors until December 15 at the Europe House in Tbilisi, Freedom Square. More than 250 pictures crafted from felt is on a display, as well as accessories like hats, handbags, necklaces and clothes. All products are available for purchase, and the money received from the sale will be deposited to the accounts of the ones who made them. Nino Elizbarashvili from the Association Woman in Business, who is one of the organizers of the exhibition, tells us that about 520 women at the prison are studying how to work with felt. She says about five groups are studying felt crafting a year, and in each group there are at least 20 prisoners. Pictures and other crafts were selected for the exhibition and selling from this year and from 2012 as well. The exhibition is organized annually. The association women and business organized professional education center at the women’s prison in Rustavi, a city 20 km away from the capital. So far 710 female prisoners participated in educational programs. 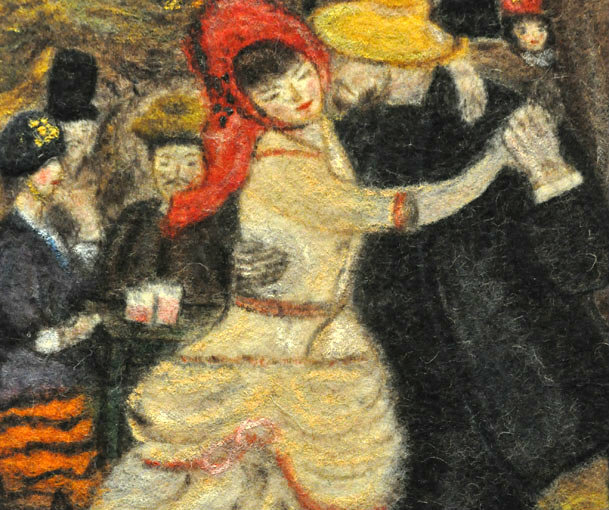 As part of the program, women prisoners studied how to make consumer thick-felt into artistic felt. Among the pictures are reproductions of well-known paintings, as well as original creations. Tinatin Shalvashvili, one of the former prisoners at the Rustavi facility, says that she thought her life was over when she got in prison. She was in grief and depression for six years, but she felt better when the courses of felt weaving was opened for them. She now spends many hours drawing and crafting. Women in prison also have the opportunity to study how to do business, and are studying legislation, planning and financing sources. 160 prisoners studied the fundamentals of business and industry. Eight of former prisoners started their own business. Two are now employed at a company in Tbilisi. Prisoners are also taught how to seek for a job and get employed; how to prepare their CVs and have contact with future employers. Prisoners study computer, hygiene and cosmetology, stylist techniques.